Josh Cowdery as Henry Shaw, Jr.
J. K. Rowling brings the magic back with Fantastic Beasts and Where to Find Them. The film which is the start of one of five new films planned by Rowling, introduces us to a whole new cast of characters set in 1926 America. The film captures the humor, and thrills of the original Harry Potter film Sorcerer's Stone quite well. With a wealth of new characters to play with along with the Fantastic Beasts, the movie will delight both old and new fans equally. 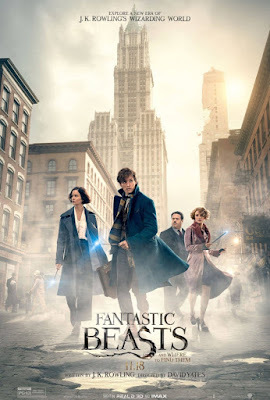 While there are some familiar references like Hogswart and Dumbledore, Fantastic Beasts is a fresh look at their wizarding world with amazing sets and costume designs that is more fitting for an Al Capone movie than what you would expect from Harry Potter. 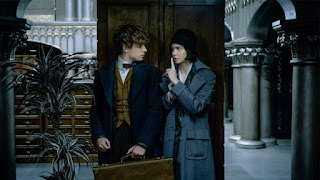 But we are often reminded that this is not a Harry Potter movie and we are fine with that as Newt Scamander played brilliantly by Eddie Redmayne makes his mark in the film. He's not alone in providing us with great performances as Dan Fogler as Jacob Kowalski and Alison Sudol as Queenie Goldstein really shine as well. Overall, if you haven't watched it yet, make your way to the theater to see it you won't be disappointed. As good of a performances from the wizards and non-mags, the Fantastic Beasts easily steals the shows, leading the way with the crafty handed Niffler. While filled with thrills, the violence for the most part is very tame making it suitable for older elementary school kids. In I.T., Mike Regan (Pierce Brosnan) is a successful, self-made man who has it all: a gorgeous wife, a beautiful teenage daughter and a sleek, state-of-the-art “smart home.” But he soon finds himself in a deadly, high-stakes game of cat-and-mouse when his I.T. consultant (James Frecheville) starts using his skills to stalk Mike’s daughter and endanger his family, his business, and his life. In a world where there is no privacy, and personal secrets can go viral by the click of a mouse, Mike needs to rely on his old connections to defeat a new kind of nemesis. 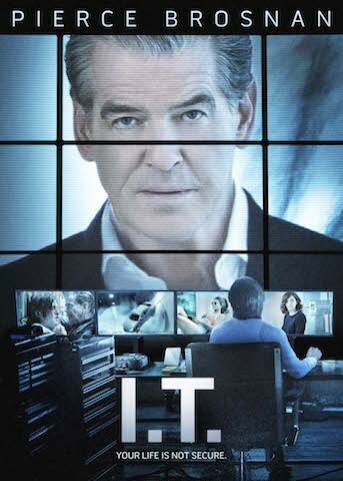 I.T. while well acted is your standard predictable revenge thriller that has been done over and over again. 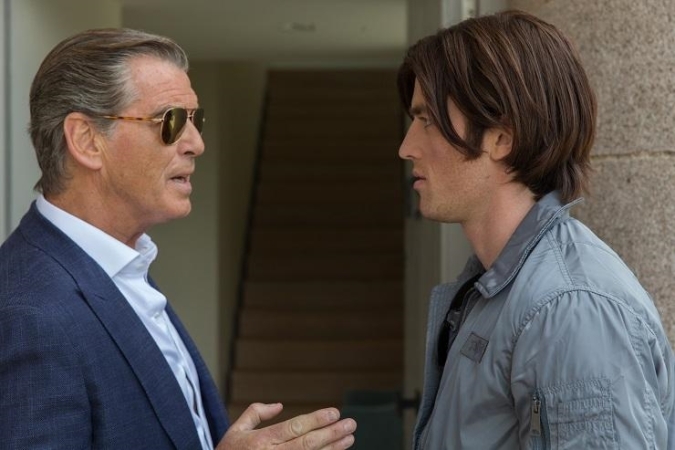 Pierce Brosnan is well cast as Mike Regan, CEO millionaire of a company described as the Uber of private jets that is aiming to become a public company. James Frecheville as I.T. consultant Ed Porter that joins his company soon becomes the bane of not only Mike's company but his family as well. Was that a spoiler? Absolutely not, considering they set him up to be the antagonist early on in the film taking away the suspense of who Mike Regan will go up against. James Frecheville's character at times silly, on a whole does a good job egging on Mike Regan. The rest of the supporting cast also does a decent job in their role considering the plot that they are handed to work with. The film while not great, is not horrendous but would be a stretch to say that it would be worth paying full price for the DVD or Blu Ray. Die hard Pierce Brosnan fans will want to pick this up to reminiscence of his glory days of playing James Bond. With the fancy suits and expensive cars, playing a man of power, they could not have picked a better role for him. The Director does a good job in providing some thrills in the end, but it is the beginning 2/3 of the film that is pretty textbook set up for this type of genre that will provide little entertainment. Overall, I would say wait for this film to show up on Netflix or cable, which is where it should have started off at, perhaps on ID Investigation or the LMN network. We are very excited to be giving away a Comet TV Swag Box to one lucky reader. Just what is Comet TV? From wild adventures on Mars to critically acclaimed classics, COMET is the ultimate home of sci-fi and horror... and it’s all totally free, no subscription needed. So what's in the swag box? Two COMET Exclusive Shirts: One - Get Skiffy “T” and the ‘We Can Hear You Scream’ Alien T.
To find out more about Comet TV, check out the below! Just how do you enter? 1. Follow us on Facebook and Twitter! 3. Comment below what Comet show or movie you're most looking forward to along with your real name and either your Facebook or Twitter name. Each household is only eligible to win 1 COMET Insider's Prize Pack to Giveaway via blog reviews and giveaways. Only one entrant per mailing address per giveaway. If you have won the same prize on another blog, you will not be eligible to win it again. Winner is subject to eligibility verification. Contest ends November 25th 2016. Open to US residents only. David Mackenzie proceeds to wow us with a small yet stellar cast in his riveting neo crime western "Hell or High Water". Before diving into every detail about the film I must confess that it is truly inspiring to see a film of this level of simplicity, in a theater. This film screams "Indie Filmmaking" in the best way possible yet still packs enough punch to make you feel like it deserves the "Blockbuster" presentation. 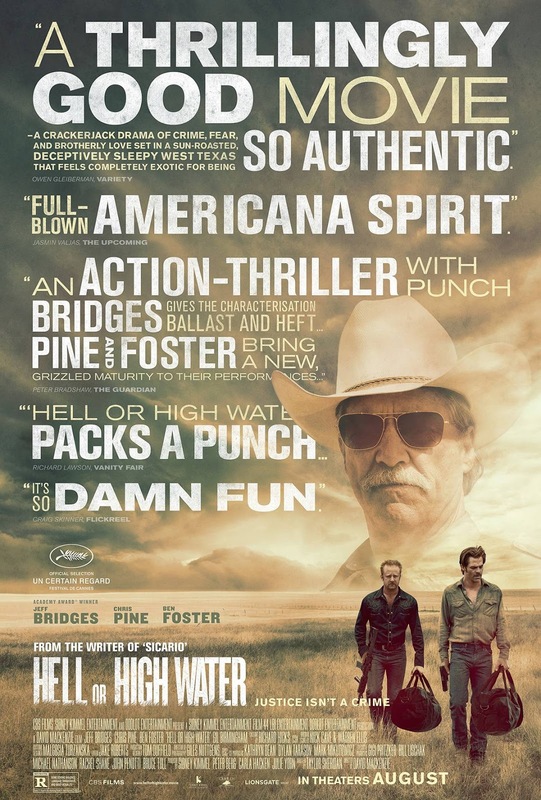 "Hell Or High Water" follows two brothers who carry out a series of bank robberies to save their family farm, and stars Chris Pine, Ben Foster and Jeff Bridges. Again simple enough yet the film has its ways of getting you on the edge of your seat rooting for the bad guys! To shine a spotlight, Chris Pine really shows us here that he's not just the pretty face to look at or just "Captain Kirk" but rather a fantastic actor just dying to burst out of his shell. 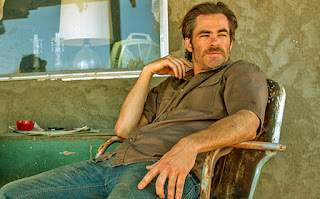 Pine plays the cool, calm and collected Brother in the film which really takes effort on his part to not look so cocky in a role. Alongside Pine, Ben Foster compliments his performance With the Crazy and wild brother looking to live life on the edge. It's no surprise that these two actors complement each other; however Jeff Bridges resurfaces and joins this stellar cast as the cop on their tale. Bridges performance is probably the most natural in the film as he is playing the older, near retiree kind of sheriff, which in my opinion took the least effort and was the most natural. I was very impressed with the writing, Taylor Sheridan who formerly wrote the screenplay for Denis Villeneuve's "Sicario", Shows us he has a knack for making the simplest of things interesting. The film doesn’t have much of a score however whatever music it does have is soundtrack and fits perfectly in the scenes used in. My main point of interest is the ability the film has to get its audience attached to Pine and Foster and even Bridges. It's very rare these days to have characters that not only have that dialogue that makes them loveable, but they have a sense of purpose that you actually care if something happens to them. In my book all the bases are covered here from good writing, to great performances to some very innovative directing on Mackenzie's behalf. Seeing this film has truly inspired me once again to want to write and direct "Indie" films, reminding me of just how close and intimate you can get with your material. I hope that the film gets a recognition for something in this year’s "Academy Awards", however if it doesn’t it is still a great addition to this year’s lineup of films. 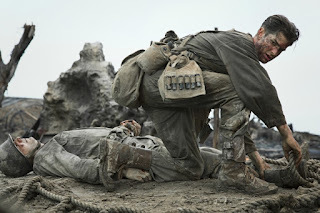 Mel Gibson returns to the directing chair to bring us the almost nonexistent remarkable true story of Private Desmond Doss, proving once again that he knows what how to handle an "Epic". Authentic costume design, natural performances and realistic and gritty war sequences are just a few of the descriptions that define "Hacksaw Ridge". Not since 1998 has society been subject to the sense of realism of war with Steven Spielberg's "Saving Private Ryan”. The comparison comes with the connection or background of the soldiers who go into war willingly or unwillingly, then moves onto their journey and horror's as they enter the field of battle. "Hacksaw Ridge" is a prime example of how a courageous biopic should be made. While the film doesn’t have all the dressings of a "Hollywood War Picture" type of film to make it look pretty, it cares more about paying respects to not only the real life Private Desmond Doss but also the brave men and woman who serve this country every day. 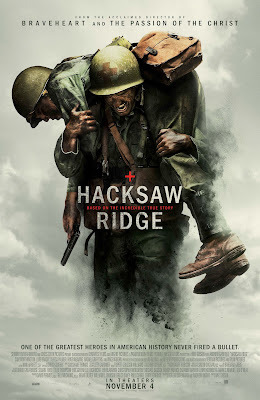 Hacksaw Ridge is an American biographical war film written by Andrew Knight and Robert Schenkkan, and stars Andrew Garfield, Vince Vaughn, Sam Worthington, Luke Bracey, Hugo Weaving, Teresa Palmer, and Rachel Griffiths. The Film follows the life of Private Desmond Doss as he enlists to serve his country in WW2 as a "Field Medic" With the intention of never using a rifle in battle. Now while the immediate idea of entering battle without a weapon is suicide, Garfield proves to us that what Private Doss did on Hacksaw Ridge is nothing short of a miracle. One of my biggest appreciations for the film is that Andrew Garfield convinced me 100 percent that he could play that southern Virginia boy with dreams larger than life. Garfield's speech coach should get just as much recognition due to Garfield's accent in the film being authentic as can be. This film succeeds where others fail because it's not afraid to let up and coming actors take the wheel. Gibson doesn't stick pretty actors into gritty roles; he fills the shoes of the real life men and woman of the story with people that you could see living this way in everyday life. Now if the authenticity of the film isn't enough, it’s intense and brutal sequences of war surely take the cake. Once the first shot is fired halfway through the film it’s as if Gibson comes to life and expresses the truth of battle. War is not a pretty sight where you make jokes with your friends and dodge hellfire until the end; Gibson shows us that your friends drop like flies and the man you've just stood next to is now fighting for his life on the ground disabled. All around the film is fantastic however I feel that during the moments when I should have stood and saluted the screen, I just sat and awaited the next shot. This is due to the pacing of the film and the all around feel that you retain 75 percent of the way through "Hacksaw Ridge”. The second half of the film does flow well however it’s the first half that does have its small speed bumps or moments of “I would have made that more dramatic" but overall the pacing of the film scores to moderate. Teresa Palmer and Vince Vaughn compliment Garfield very well in the film proving they are not just filler actors, they make you care for them and in my book that a job well done. Overall from the beautiful realistic expression of war to the natural flowing dialogue and performances make "Hacksaw Ridge" a fantastic, emotional thrill that will certainly make its way to this year’s "Academy Awards". In my opinion while the performances were natural, none of them were "Oscar Worthy". However, Mel Gibson proves he is back and here to stay and should at least be recognized for his directing here.